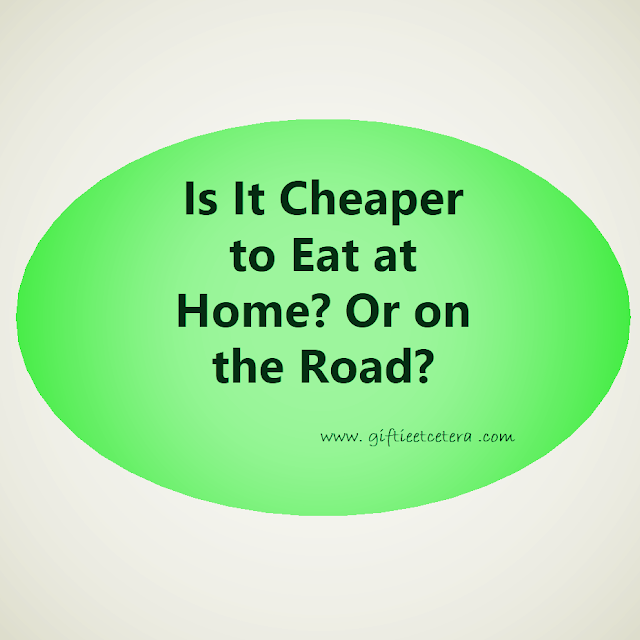 Cheaper to Eat at Home? Or on the Road? | Giftie Etcetera: Cheaper to Eat at Home? Or on the Road? I live in the suburbs, but my kids go to school in the city. Sometimes, especially if I run errands in the city in the middle of the day, I'm tempted to just eat out. I have a list of inexpensive, diet-friendly foods that I order regularly in my planner, so I know where I can eat for under $5. But I can make almost any meal at home for less than $5, so how do I know if I should go home to eat? I've figured out a way to make the decision. Confession: if you are still reading, you show know that today's calculation is based on Popeye's chicken tenders (man, that barbeque sauce is AMAZING) and NOT on the aforementioned healthy lunch! Popeye's three chicken fingers (spicy, just the tenders please) cost $4.35 with tax in Baton Rouge, Louisiana. Driving home to eat and back to town to pick up the kids cost...well, let's figure it out! 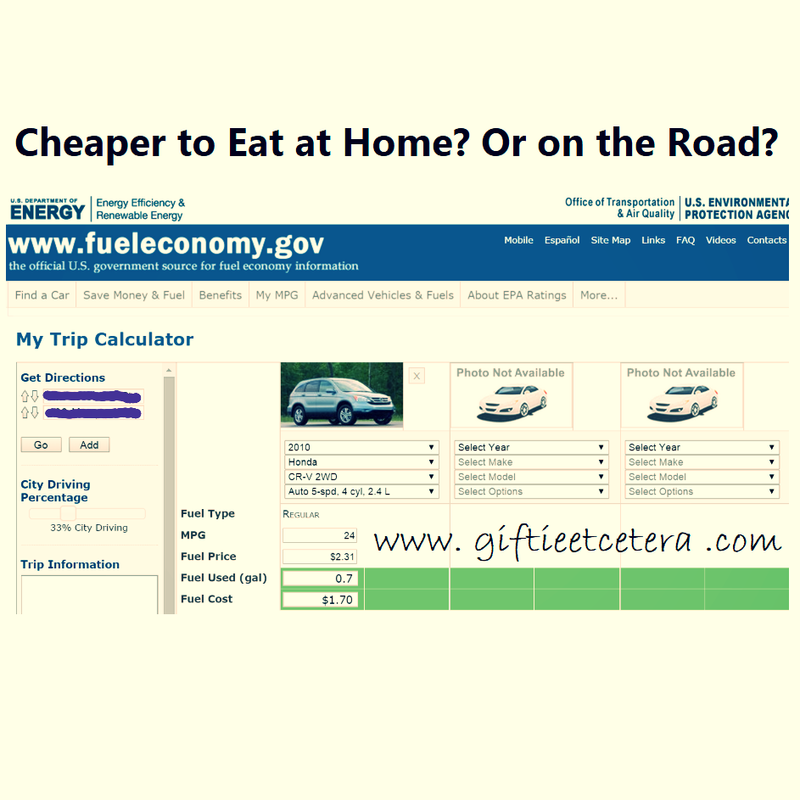 I rely on www.fueleconomy.gov to calculate the cost of gas. I just put in my starting point and destination address. My 17 mile trip (times two because I have to go home and then come back to the city for afternoon carpool) costs $1.70 x 2 in gas, which equals $3.40. TIP: Once you have calculated your normal cost, assuming gas prices stay relatively stable, you can write that number in your notes/file section of your planner and never calculate it again! $4.25 - $3.40 = $0.85, so the big question is whether I can eat at home for under $0.85. Maybe, if I had red beans and rice or anything relatively cheap meal prepared. Instead, I have chicken breast tenders and some grilled veggies in the fridge, which costs about $2.00 to make. So, for today only, I'll be eating Popeyes! BUDGET TIP: If you know you will be staying in town, pack your lunch. I don't always know if I will, but when I know it, I always pack my lunch. Good way to look at it. For me, it can be a balance of time, money, and energy. But if it's Chick-fil-A, I'm going to pick that every time! Now I'm craving some Popeye's Chicken...LOL! Thanks so much for sharing at Share The Wealth Sunday! Impressive calculations! Thanks for sharing at the Weekend Blog Hop at My Flagstaff Home! I live 30 miles away from the nearest shopping area, so I always eat out when I'm in town, but I should really start packing lunches more. The kids love it when I do, because we usually go to a park and have a picnic (we'll do that with drive through too). Thanks for linking up to the Country Fair Blog Party!